Seems like a great place to say hi. I'm Tim Box from Box Soft. My only claim to fame is I was involved in Private Enterprise the Fanzine for the Enterprise computer. And some how started selling software for it. Unfortunately I no longer have any hardware as I gave/sold of my remaining kit to a collector 15+ years ago. Two enduring memories are of Peter Hiner who wrote ZZZip. He is one clever guy who was really a great chap to boot. And Kevin Richards who the first time he wrote to me ended with Kevin Richards 14.5 years old. From my informations (magazines, etc) I think you are a central person of the UK Enterprise life. Made a great support for the users which are not got to many official support from the Enterprise company. I think the most easy: there is the magazines archive. We have all Private Enterprise magazines or exist any more? If possible you still have any documentations, schematics, letters, anything from the old good days? Welcome Tim. I'm glad you joined. How did you start with computers? Did you have any other machine before the Enterprise? And how did your story start with the Enterprise? That collector may have been me, not too sure, memory not as good as it should be! This was years ago and when I first got into the Enterprise scene with Jean Pierre Malisse. Do you remember the Hungarian contact Mr Kopácsy? If yes, could you please tell us some story? Russ, if you went up into the loft with me to look at them, then it will be you. Also part of it was a monitor. It was like a box with minimal bessel. You said you and your friend/colleagues liked to set themselves a task of converting spectrum games over. I was impressed! My computing started with a Spectrum 16k. I was never any good at programming but had fun with it. I built an XY plotter that I used to draw and scan images. And even drew my girlfriends 21st birthday invite with. Later when I got my Enterprise I scanned some more images (very slowly) if there is one out there of an astronaut on the moon with a reflection in the mask. That was done on it. When I first heard of the Enterprise I was in awe. But it took a long time to get to market. Eventually it was available and I got one. From the start I was wishing for a mouse, I used to stare at it for hours thinking how cool it would be to use one. In the end I did it my self. I can remember calling up the coder who wrote for it on the Commodore asking how you talked to it. As I was crap at coding I then passed that on to someone else. Andrew Richards took over the coding and wrote the drawing program that was sold with it. The hardware was my design but as you can see if you ever saw one the edge connectors were a pain, sometimes requiring that you finely adjusted by trimming the heat sink. The emulator was a prime example of vaporware. I worked out what I want to do and how to do it. But relied on others for help. Their commitments meant they were not able to always help. I got one working (kind off )in the end but it taght me not to go promising anything until you could deliver. I can't remember how we started Private Enterprise but it meant I got to play with all the software and hardware which was great. There was a young lad who did all the initial artwork. He was fantastic, he gave it up in the end and Eamon O'leary took over. I started BoxSoft as I thought that the advertising Enterprise was doing was not upto much and I could do a better job. Great to see you back Tim! As a one-off contributor to 'Private Enterprise', how many of these were produced in the end. Is the tally more or less equal to the archive here, or were there some more issues that haven't seen the light of day? It's been a long time, names such as 'Neil Blaber' are stirring in the back of my brain, wonder what happened to him? I built an XY plotter that I used to draw and scan images. Wow, it is amazing! I understood the drawing... but how worked the scanning? Something light detector replaced the drawing pean, and it is report the pixel colours? Later when I got my Enterprise I scanned some more images (very slowly) if there is one out there of an astronaut on the moon with a reflection in the mask. That was done on it. Todays the SymbOS make a new life for your interface, you can see it in my video Now thinking about a modern (PS/2 or USB) interfaces, but viewing from the Enterprise sw side will be compatible with the Boxsoft interface! Anyway very interesting idea and story! 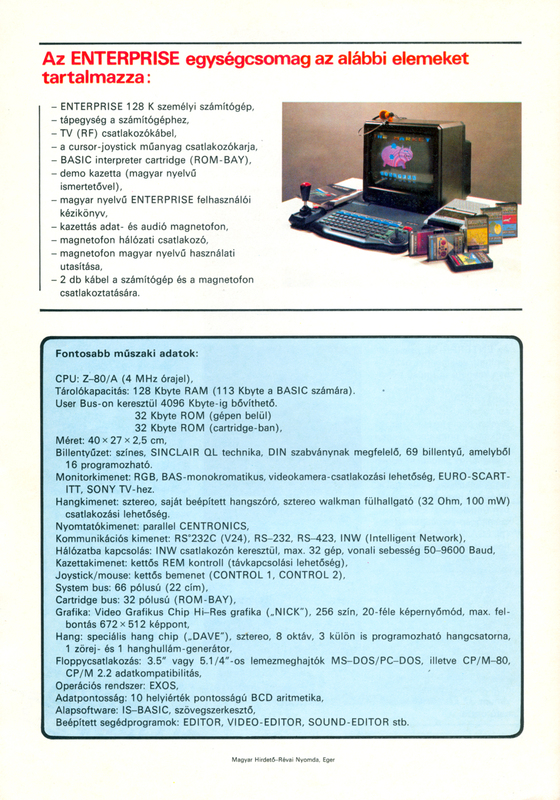 Will be very interesting: the final released emulator from the Hungarian 'a' Studio are the redesigned version of your? In your letter what gflorez copied here, you wrote the idea of the keyboard conversion. And how worked the screen attribute conversion? Hello again Tim. I'm Gustavo from Spain. Seems like the communities or clubs of Enterprise owners have been isolated each one in its different country, not knowing very much of what was happening outside(Internet was being born then). In my case, in Spain I also was isolated, but for other reasons, as at that time I didn't know any other Enterprise owner. But a few years ago some of your material surfaced (now we know it was yours) and then we learned about the existence of Private Enterprise or Enterprise Computing International magazines. Now all the members understand the obscure business of some Hungarian companies, but there are things of that years we still don't know. Do you know something about that HD project? Wow you found them! They bring back memories. The scanning hardware was a rotring pen nib that I pulled the guts out of and stuck a LDR (with a lens I think) to the top. Then just raster scanned the image (the space man was in a news paper). At every pixel I worked out the gray level and plotted it to the screen. The stars in the background I think were added later. The other image I think might have been a composite of 2 images where they were xored selectively using the drawing program that I shipped with the mouse. It was not until many years later I heard the Enterprise went over to Hungary. I thought it all died as the parent company filed for bankruptcy in the UK. Its great it got used more. The Private Enterprise magazine tally looks kind of right in the end others took over, Eamon would know for sure. I used to keep a collection in my loft but cleared it out in the past. From memory there was only a floppy interface developed by Enterprise themselves. When I looked at hard drives they were massive and had no memory I do not remember one being available while I was playing with it. I tried opening the link to the ECI mag but it just brings up blank pages so cannot see it brings back memories. Neil Blaber you can kind of see where he was going as in the last IEUG mag is pushing disks with MSDOS freeware. Last I heard from him he was a manager of some tech department. I would have to look back through linked in to see where exactly. Kevin Richards last I looked runs a company writing compiler optimizers for the games industry. It fits as when I knew him he wrote his own asm compiler. Sorry I will write more but have some orders to fulfill before tomorrow so better get on with them. 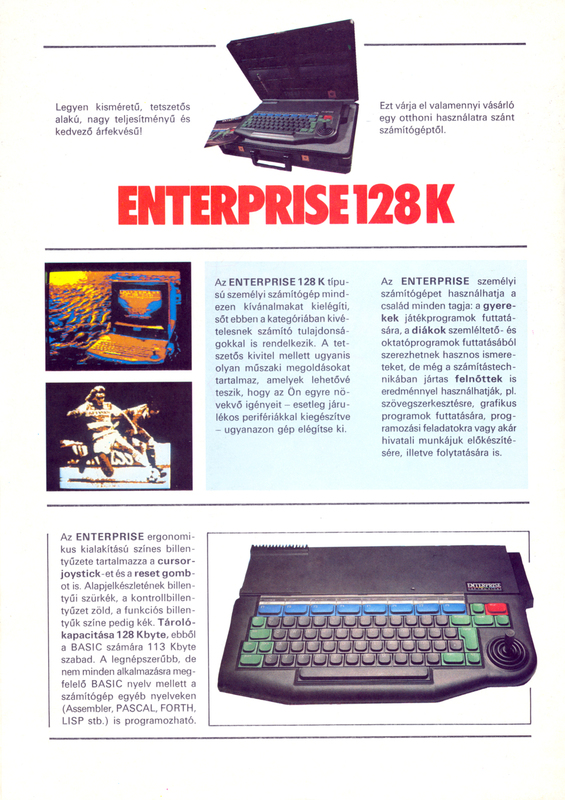 Yes, in Hungary the Enterprise very successful! 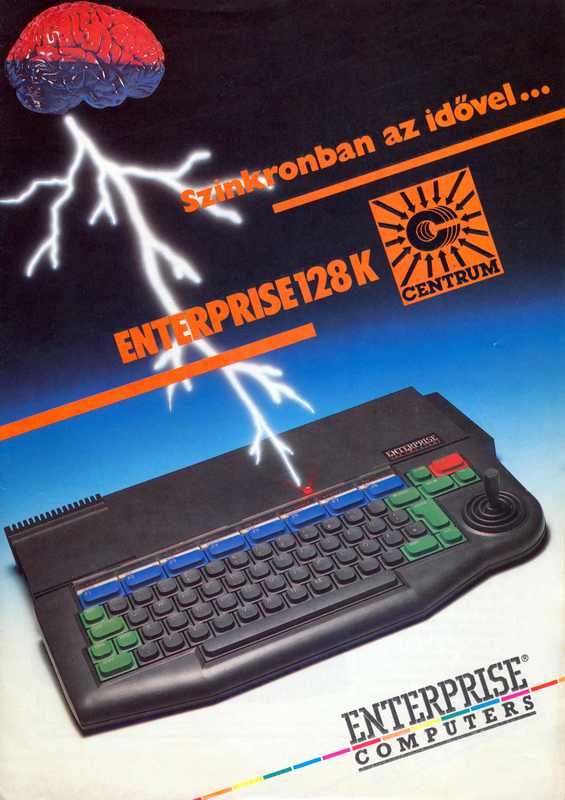 More than 20000 machine sold, I think the EP are the third most popular 8 bit machine in Hungary after the C64 and ZX Spectrum. 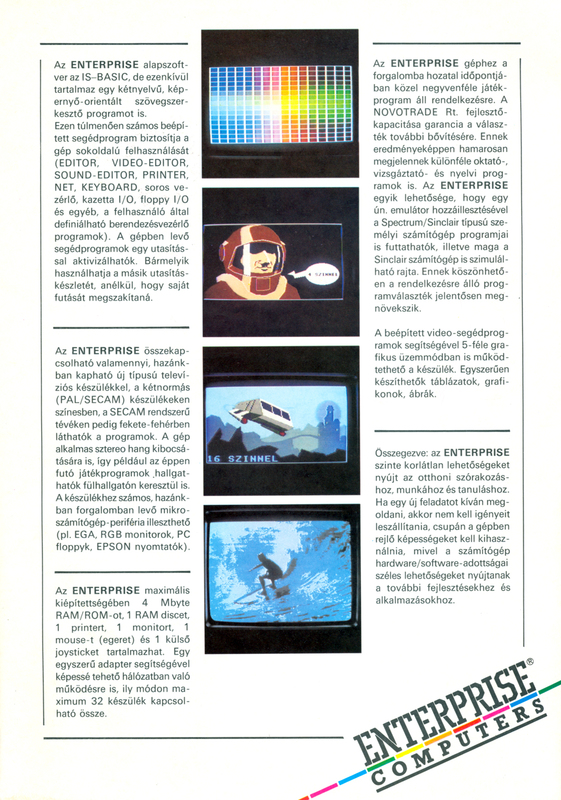 The main Enterprise era going from 1987 to 1995 in Hungary. And after few years pause on the internet started the Enterprise community again. 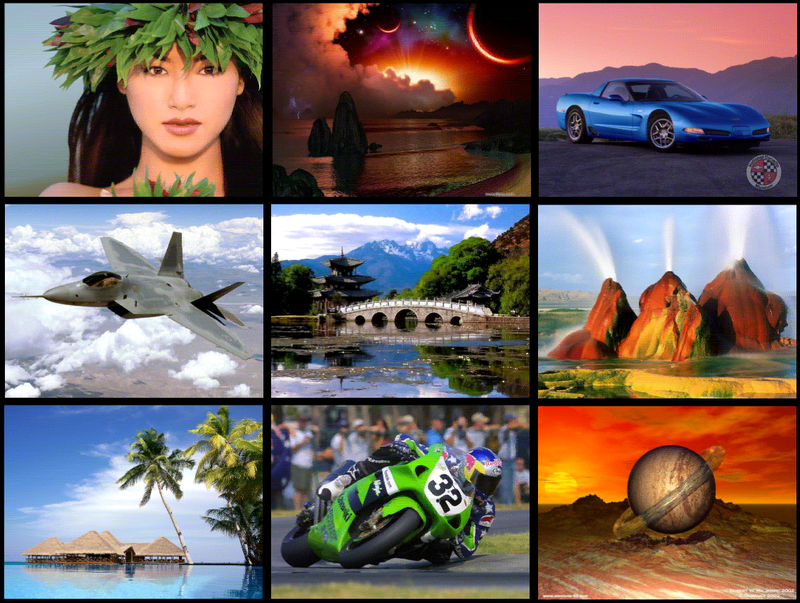 It is including two more images, the football players and windsurfer. I think these also yours, it is true? Only few years ago when I got some IEUG and Boxsoft tapes found these as real Enterprise picture file. Ok, today we know the Nick can do many more better , but in the '80 years your images shocked me, what a fantastic images! When I found the real picture files then I thought these are video digitized, never thought about scanning! About the ECI: it is a PDF file, try to download it, and open directly with Adobe Reader. Yes the footballer looks right and the surfer is definitely correct. Are those other images really from an Enterprise? WOW is all I can say. If only we did that back then. Page created in 0.258 seconds with 29 queries.